Slim aluminum. Yet another offshoot of the Asus Zenbook product line is to attract quality-conscious customers who also value high mobility. An energy-saving Haswell CPU alongside its integrated graphics, paired with a high-capacity battery, and an ultra-thin aluminum casing - is that enough for a new record in terms of endurance and battery runtime? The Asus Zenbook line is continually growing. 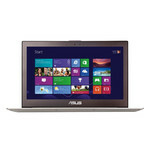 In the meantime, the premium and at the same time mobile ultrabooks from Asus are available in many different configurations. For example, with Intel's integrated HD graphics in the UX32LA-R3025H or, for 200 Euros (~$272) more, with a dedicated Nvidia graphics chip from the latest generation, together with a Full HD screen in the UX32LN-R4053H that we recently tested. All Zenbook family members have the newest processor technology, a high-quality aluminum build, and slim dimensions for mobile use in common. 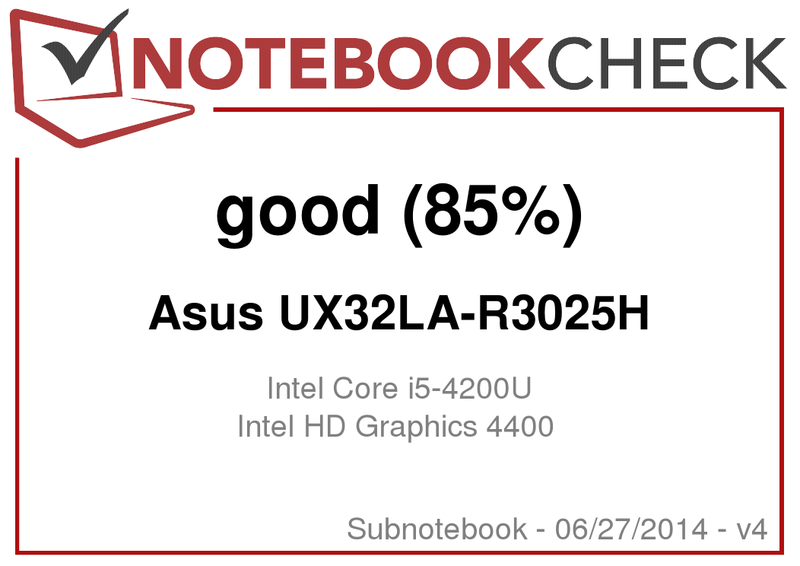 In addition to the economical Intel Core i5-4200U with an integrated Intel HD graphics and a 13.3-inch screen, Asus' Zenbook UX32LA-R3025H has even further tidbits. Besides a swift 128 GB SSD, the ultrabook can fall back on 8 GB of working memory, and a long-lasting 50 Wh battery with good runtimes. Does that justify the price of 800 Euros (~$1087)? There are enough potential contenders. Other manufacturers have very similar configurations in their lineup, such as Lenovo's IdeaPad U330p or Sony's Vaio Pro 13 SVP-1321C5ER, or models from Samsung and Apple. All tested models feature a high-quality aluminum casing, and a similar CPU-GPU combination. We used the devices from Lenovo and Sony for comparison in our following analysis. 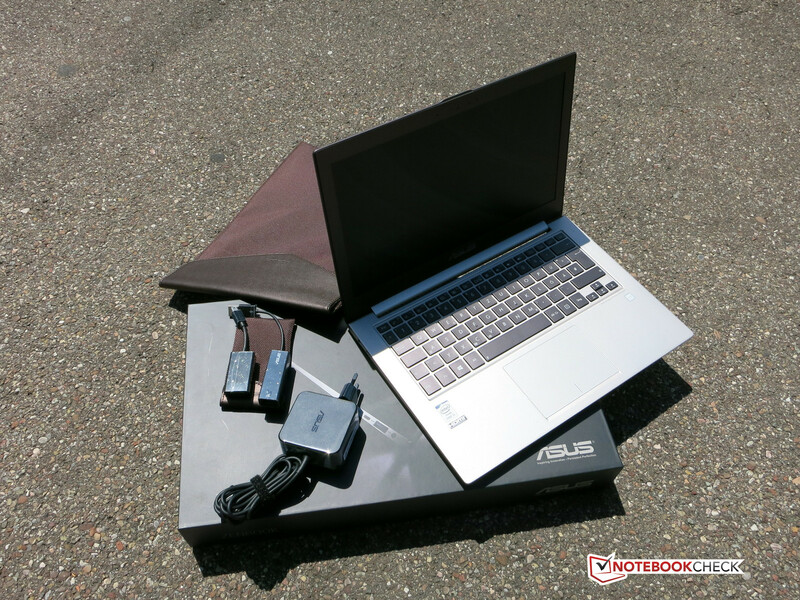 Can Asus stand out from the masses with its new Zenbook configuration? The casing's exterior is made completely of metal - a clear advantage for Asus over budget models. 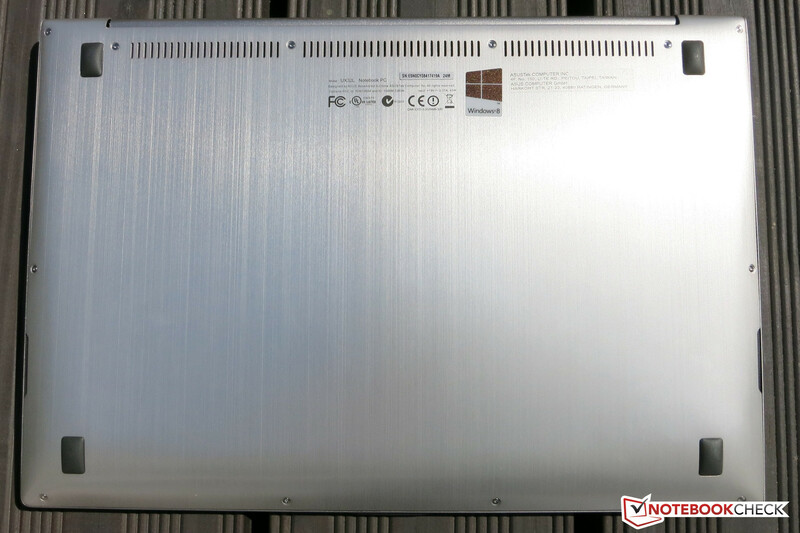 However, aluminum is almost standard for the contenders from the ultrabook category. 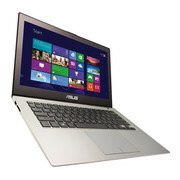 Asus' laptop additionally scores with the immaculate processing of the high-quality materials. The entire chassis is milled from one piece of aluminum and this prevents annoying transitions or irregular gaps. Only the display bezel is made of plastic for relatively logical reasons. However, it also makes a very high-quality impression, and can barely be distinguished from the other materials. The continuous hinge only allows opening the display to a fairly small angle, but it only wobbles marginally. 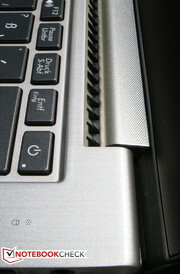 It is quite possible to open the ultrabook with one hand. Another advantage of this construction is found in the casing's stability and rigidity. It is not possible to dent or significantly warp the Zenbook's surface, even with strong pressure. This is also true for the display protected by an aluminum back. The size is befitting for an ultrabook, although this term should actually not be used when following Intel's specifications due to the lack of a touchscreen. Nevertheless, the dimensions are compelling, even if they are a bit higher than that of the Sony and Lenovo contenders. The reason for this is the somewhat broader edge around the display and keyboard. 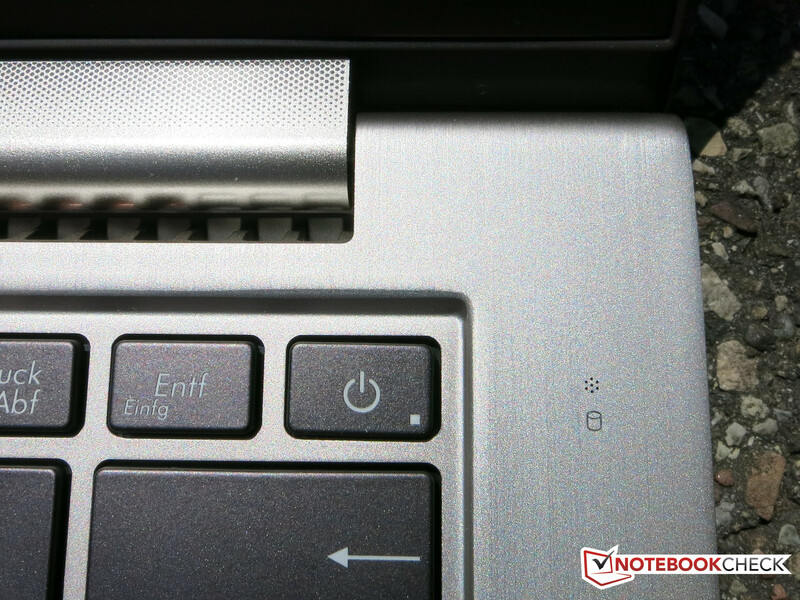 However, the height of only 18 millimeters (~0.7 inches) is on par with the IdeaPad U330p. The weight of 1.45 kg (~3.2 pounds) is slightly lower than the IdeaPad, but considerably higher than Sony's laptop, which is only 1.06 kg (~2.3 pounds). Just like the other members of the Zenbook family, the UX32LA only provides average interface diversity in all its configurations: three USB 3.0 ports, an SD card reader, and an audio jack. The Ethernet port is only included in the form of an adapter cable - likely because almost everyone uses Wi-Fi at home or on the move nowadays. As to video-out, an HDMI port is combined with an adjacent mini-DisplayPort out. Consequently, the Zenbook can also deal with 4K material. An older VGA port is no longer installed, but an adapter cable is also included for this version. 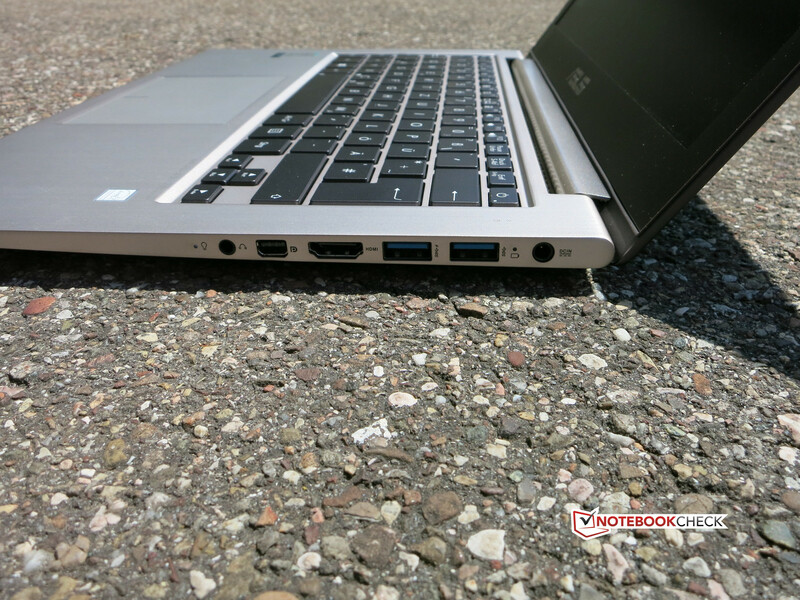 Asus solves the placement of the existing ports very well, and distributes them only on the laptop's sides, most on the right and well accessible for the user. Furthermore, the interfaces are in the back third, likely also for construction-related reasons. Consequently, space related restrictions would never occur even when using an external mouse. Unfortunately, the ports are spaced quite tightly so that larger USB sticks might cover the neighboring port. The Wireless-AC 7260 Wi-Fi module from Intel does not only support all crucial wireless standards (802.11a/b/g/n/ac, Bluetooth 4.0), it also supports dual-band (2.4/5 GHz), and is dual-stream capable (2x2 TX/RX). Very high data transmission rates can be achieved in conjunction with the matching 802.11 ac router. However, this powerful wireless module is needed in view of the missing network interface. The connection quality was always very good. Connection downtimes or significant losses in reception were not recorded in either the router's direct vicinity or two stories above it. Windows 8.1 was preloaded on the tested version of our UX32LA review sample. A Windows DVD was not included in the laptop's box. Users who want to install Windows 7 will have to look around for the corresponding drivers. 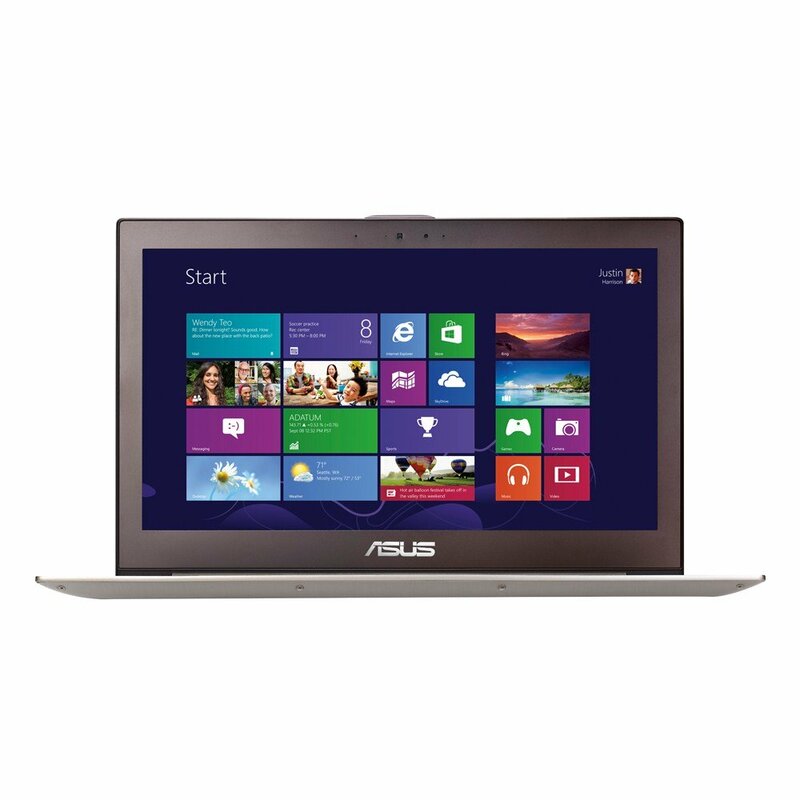 Asus does not offer any drivers for other operating systems besides Windows 8.1 on its homepage. Besides a slim, 65-Watt power supply and the usual brochures, the UX32LA-R3025H comes with both a VGA adapter for the mini-DisplayPort and Ethernet adapter for a USB port. 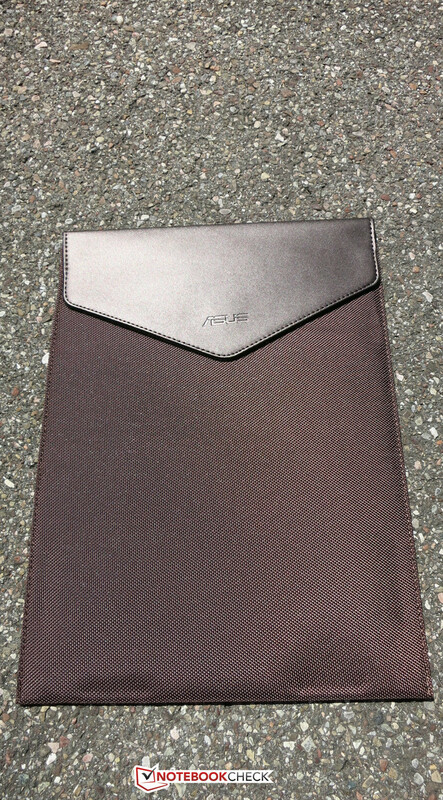 Asus also includes a small, yet high-quality sleeve. 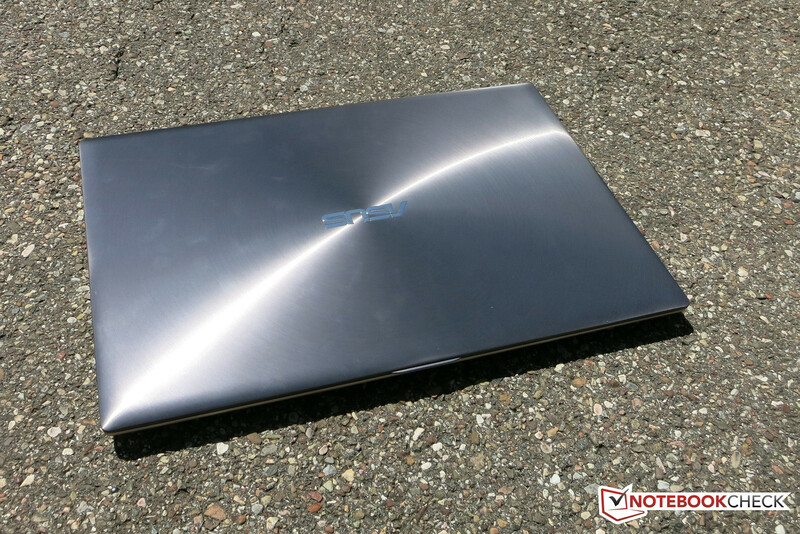 It not only looks good, it also protects the Zenbook from scratches and light shocks. We were rather annoyed by the preloaded software in the form of apps and utilities, and they do not include any significant installations. We would delete the majority because they might unnecessarily slow down the system. Asus did a very good job with the maintenance options of its Zenbook. The casing's underside can be taken off completely by removing 12 small Torx T5 screws, and all innards can be accessed. 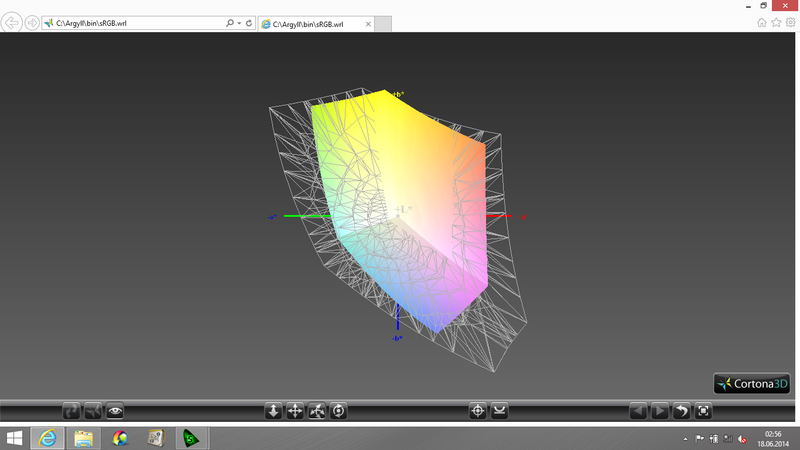 A few screenshots concerning this can be found in the review of the UX32LN-R4053H model. It is generally possible to access the mini-PCI Wi-Fi module, the memory bank with a 4 GB RAM bar (4 GB are additionally soldered to the motherboard), and the 128 GB, 2.5-inch SSD. In principle, the battery could be replaced, and the fan including the heat sink can be cleaned easily. 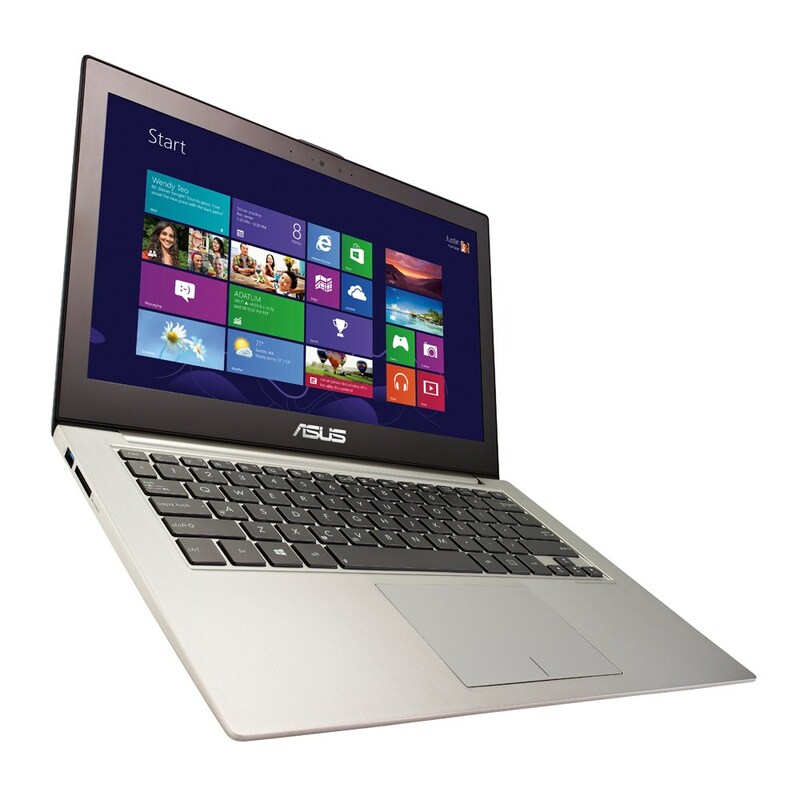 Asus includes a manufacturer's warranty of two years on its premium ultrabooks. It can be upgraded by one year for a surcharge directly when purchasing the device. Asus demands considerably less for this than other manufacturers only charging approximately 80 Euros (~$109). The incorporated ClickPad without dedicated buttons is pleasantly sized with a diagonal of 12.5 cm (~4.9 inches), and it supports multi-touch gestures. It also functions very accurately, and clearly stands out from models in cheaper devices in this regard. It is quite possible to bridge a certain time without an external mouse and without despairing after only a few mouse movements. The pad's color is virtually the same as the surrounding aluminum, and it features a sleek yet pleasant surface. The integrated mouse buttons are only visually separated, but have a good pressure point. Every input is confirmed by a rather loud click noise, and the user is soon tempted to double tap the surface instead of using the integrated mouse buttons. 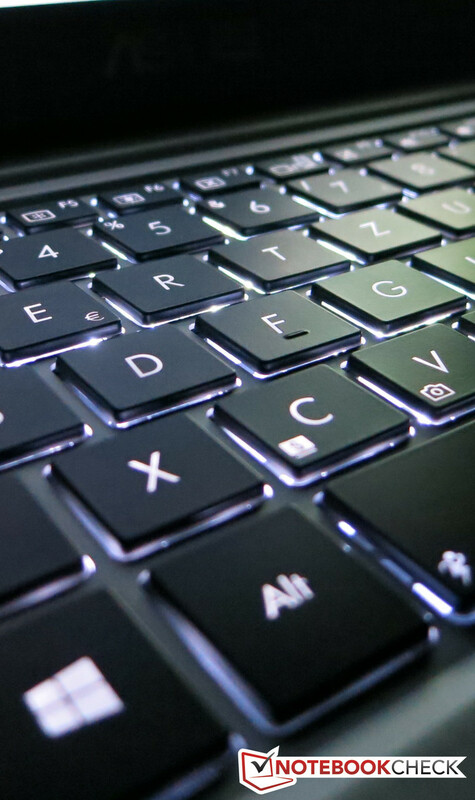 The loud touchpad buttons could occasionally get distracting, particularly in quiet surroundings like in a library. 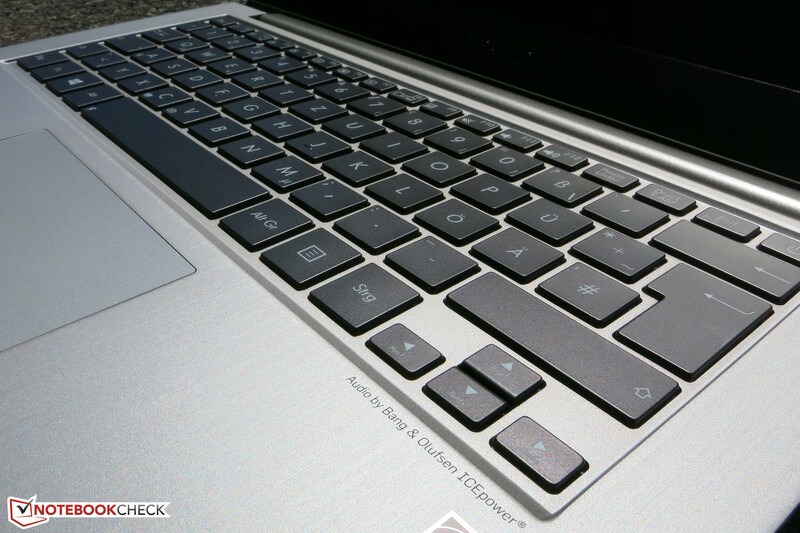 Asus' laptop features an agreeably sized, backlit keyboard. That allows typing and working without restrictions even in the dark. The key size of 14 x 14 millimeters is thus the same as in other laptops from the 15-inch category. However, a dedicated number pad is not installed. Unfortunately, the power button has been moved from the casing to the keyboard. Though this looks good at first glance, it becomes adverse when the user accidentally turns off the ultrabook instead of hitting the adjacent delete key. The keys feature an extremely accurate pressure point, and a favorable drop. Typing frequently should therefore be comfortable and pleasant. Unlike the ClickPad, the keyboard's stroke noise is very convincing. 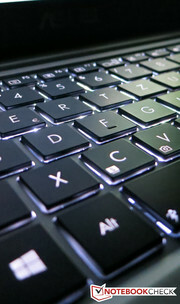 A clattering of the keyboard's bed was never audible, as often heard in some areas of the keyboard in cheaper models. The keyboard's quality equals the build of the laptop's casing. Asus installs a 13.3-inch screen with a native resolution of only 1366x768 pixels in this configuration of the Zenbook UX32LA. The resulting pixel density of not quite 118 ppi is of course higher than in 15-inch models, but considerably lower than in devices with a Full HD screen. The pixel density would be at least 165 ppi here, and would make a much sharper image possible. 1920x1080 pixels should be standard in 800 Euro (~$1087) ultrabooks, and certainly offers the best value for money ratio. 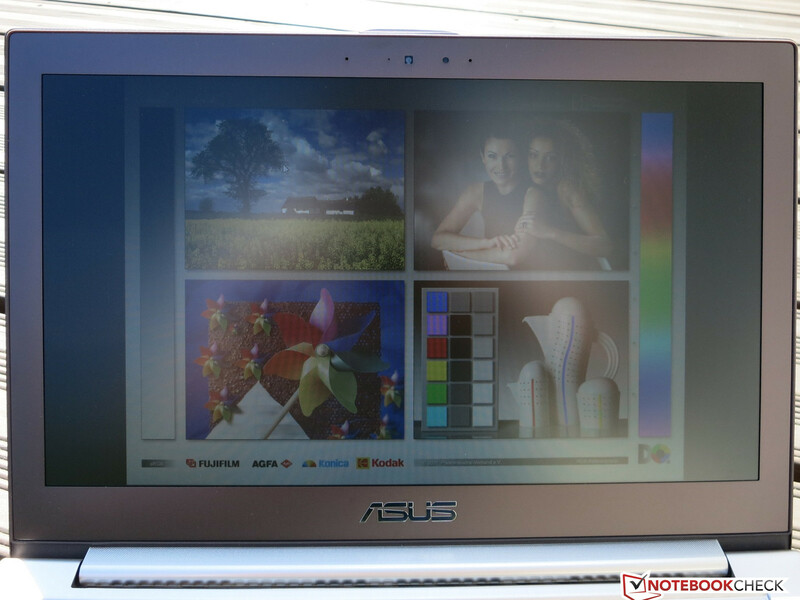 Other models also sport a 2K resolution or even 3200x1800 pixels as in the case of Samsung's ATIV Book 9 Plus 940X3G. This is almost a bit exaggerated in a 13.3-inch device, especially since these pixel densities only lead to a marginally noticeable quality improvement, but a considerably higher price. 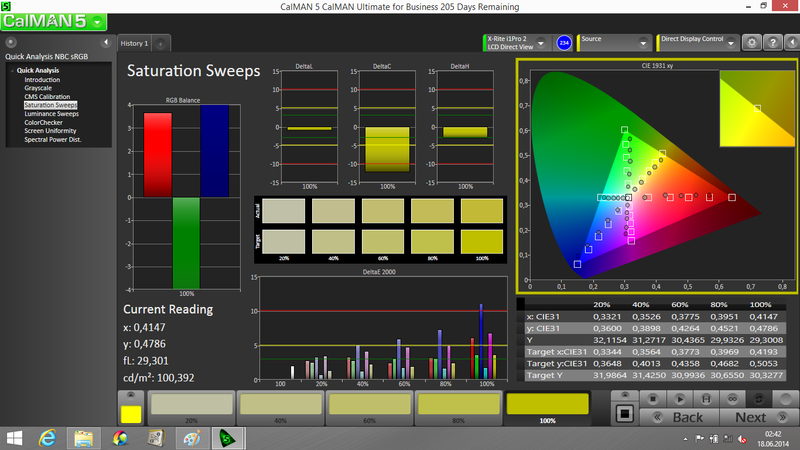 Unfortunately, the installed screen only has a relatively low maximum brightness of 253 cd/m². Users who are used to brighter screens will have the feeling that the maximum is not yet achieved even when the highest possible brightness is set. 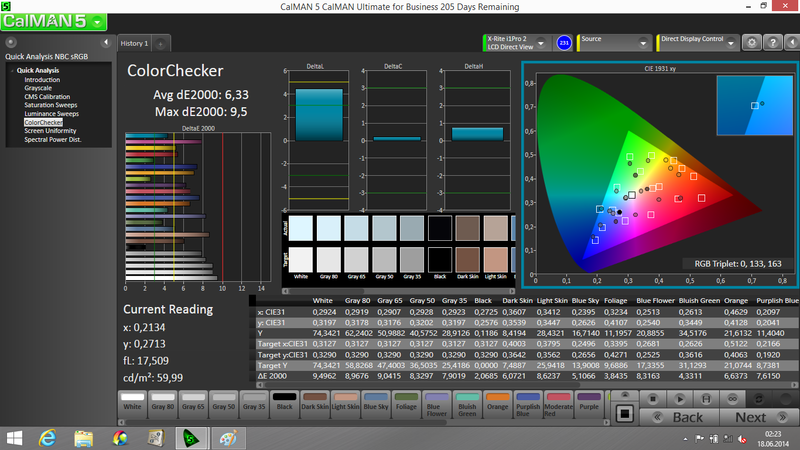 The immediate sister model UX32LN-R4053H again proves that this can be done better with rates ranging from 344 to 372 cd/m². 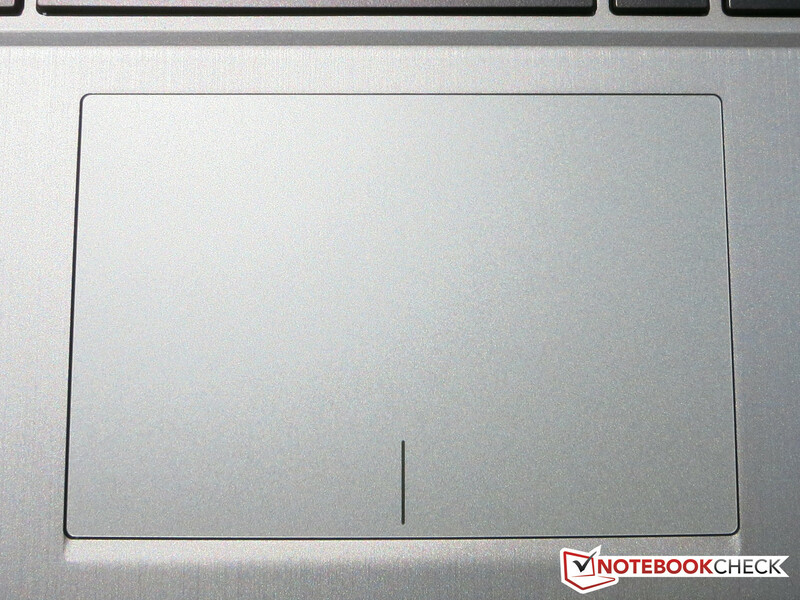 Sony's Vaio Pro 13 SVP-1321C5ER is also within a much better range. 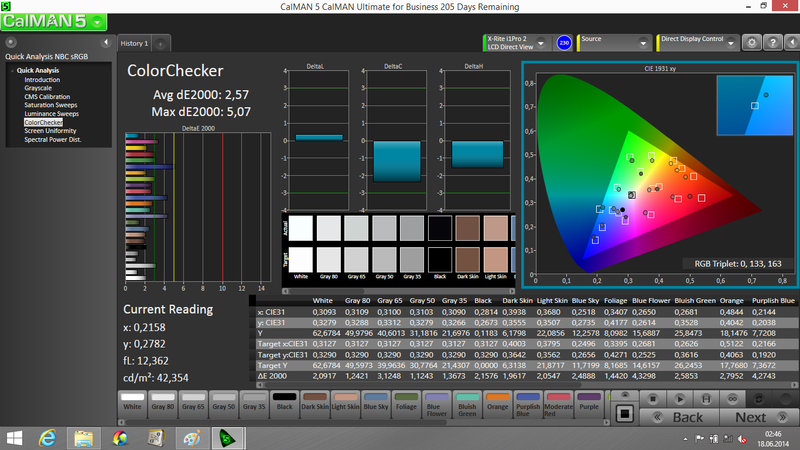 The contrast ratio of just 491:1 is achieved due to the low maximum brightness and a black level of 0.51 cd/m². 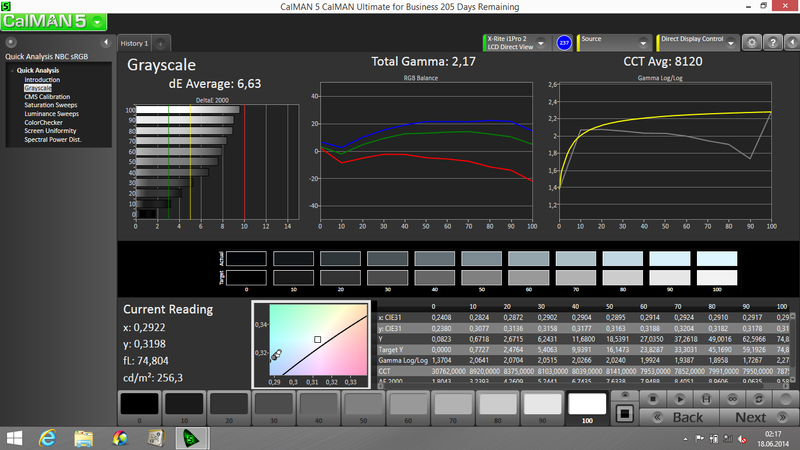 The DeltaE 2000 rates for the grayscale and color saturation were both very high, and thus poor, with 6.63 and 6.33 prior to our calibration. It is assumed that the human eye will not discern a difference between the sRGB pattern and the native pattern in terms of the color edges with a DeltaE 2000 of below four. 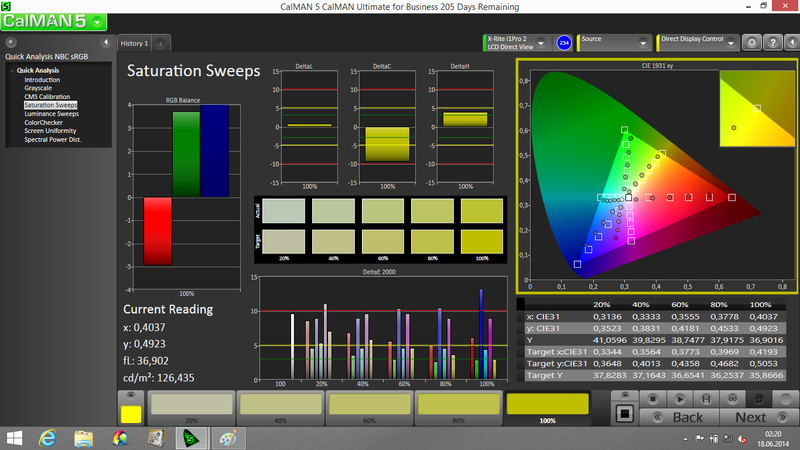 Excellent rates were achieved after calibration; the DeltaE of color saturation dropped to 2.57, and the black rate was even 1.79. 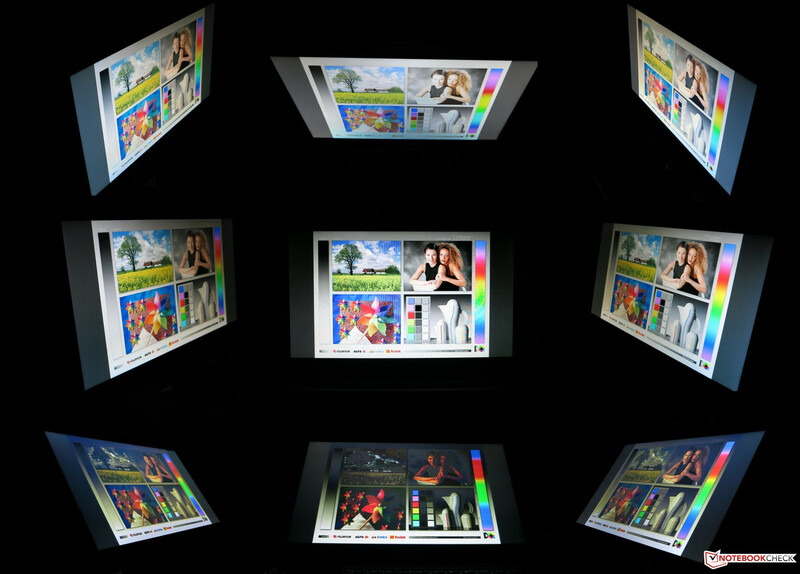 Now only the limited color space of just 62 percent of sRGB and 44 percent of AdobeRGB prevents use in the professional image and graphic fields. 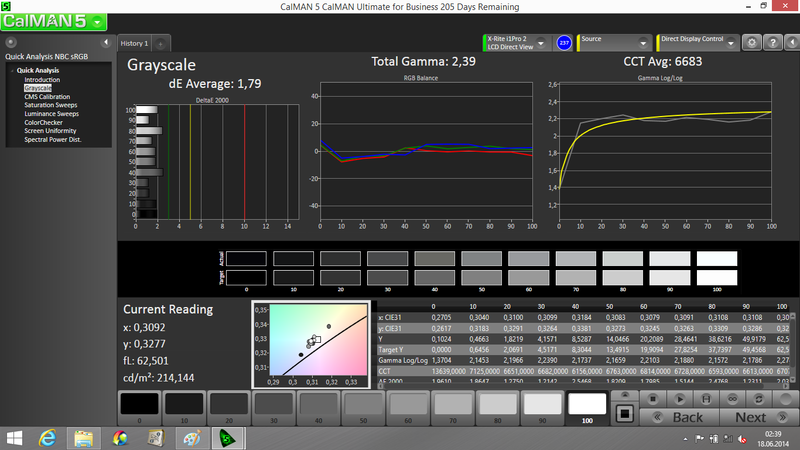 Thus, calibration is quite recommendable even for home use. 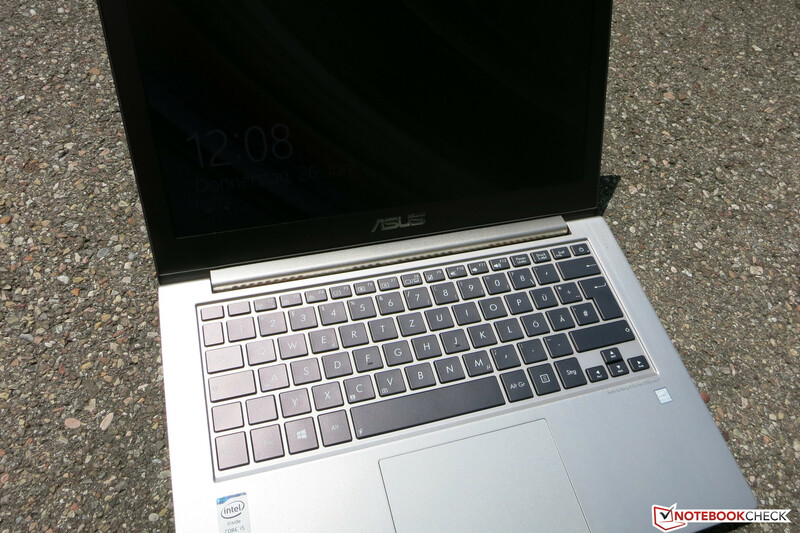 The fact that Asus does not use a glossy screen gives a decisive advantage: It is possible to work with the device even outdoors as long as the sun does not directly shine on the screen. The drawback of the low maximum brightness is then apparent again, and not much can be recognized on the screen. However, the screen should not be the deterring purchase factor when the laptop is to be mainly used indoors. The subjective overall impression is much better than the measured rates indicate. The viewing angle stability is acceptable. Although minor color deviations occur when the screen is tilted to a certain degree, but they are only quite weak and still tolerable. To deal with the section about performance properly, it must first be clear what requirements are placed on an ultrabook. The very first points are battery runtime, compact dimensions, and portability. However, the processor, graphics, and system performance follow right behind that. Asus tries to cover all these points with the swift and economical SSD, and Intel's i5-4200U CPU. It fuses decent dual-core power with low power requirements, and is also responsible for video output. It is possible to work well with the UX32LA, and even games are possible though with major restrictions. 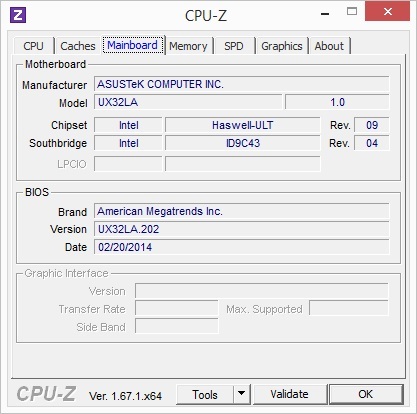 Intel's i5-4200U is specified with a TDP of just 15 Watts. That is twice as high as current SoC (system on a chip) systems from the Bay Trail range, but the processor performance is also many times higher. Besides that, it is still less energy consuming than the standard i5-4200M. The "U" model from the ULV line (ultra low voltage) only reaches its TDP in full load, and should run far below this rate in idle operation and achieve good runtimes anyway. 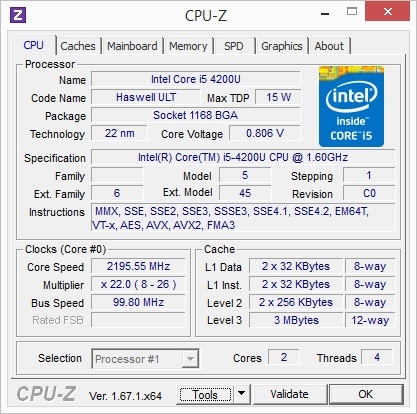 The i5-4200U supports Hyperthreading, and can thus process four threads simultaneously. Turbo Boost dynamically increases the base clock rate of 1.6 GHz to 2.3 GHz in dual-core applications, and 2.6 GHz when only one core is loaded. Both cores have a level 3 cache of 3 MB available. The ascertained performance rates are all on a high level for a ULV processor. 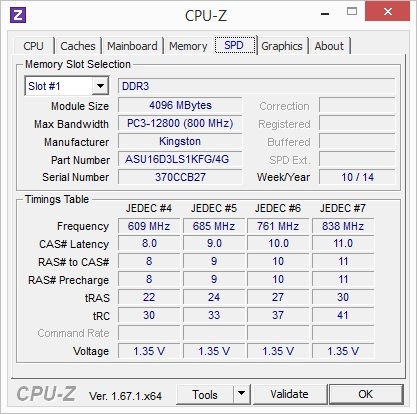 Compared with the standard i5-4200M model that has a more than twice as high TDP of 37 Watts, the average benchmark scores of the U-model are only 24 percent lower. The i5-4200U is certainly not a bad choice, providing the cooling is sufficient and the processor can often use its Turbo rate. The single-core performance is roughly on par with Intel's Core i3-3110M processor in Cinebench R11.5. The even more frugal i5-4202Y, with a TDP of just 11.5 W, lags behind by 15 - 25% depending on the installed hardware and cooling. 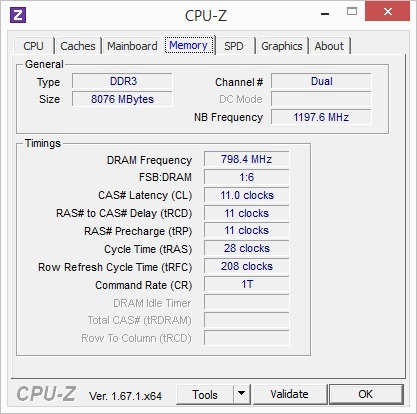 AMD's current A10-5757M top model cannot compete with that, and closes in by only 13%. This does not change much when all cores are loaded. 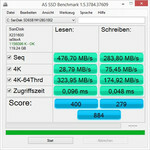 AMD's A10-5757M is still just behind the review sample, but clearly reduces the gap. The i5-4202Y is now located approximately 25 - 30% behind that. The i3-3100M is still just as fast, but with an over twice as high power requirement. The system's performance is consistently at a high level owing to the swift processor and speedy SSD hard drive. Higher performance is clearly noticed compared with a laptop without an SSD. More storage device intensive applications, such as software installations, are performed much faster and smoother. It is also possible to continue working without disruptions during larger copying processes, which is sometimes a problem for HDD-based systems. About 12 seconds pass from booting the system until the desktop appears, and the startup programs are completely loaded only three to five seconds later. The Zenbook does not take breaks even during operation, and thus smooth work is always possible. 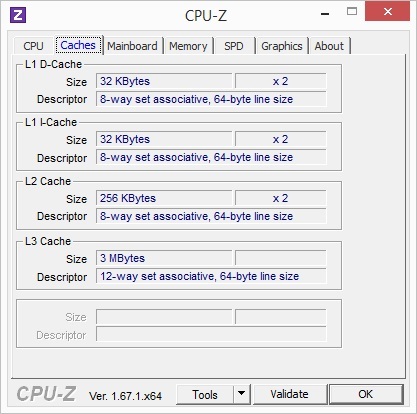 A difference to standard voltage processors is noticed mostly when really CPU-heavy software is used. The system achieves 2583 points in the PCMark 8 Home and 4643 points in PCMark 7 benchmarks. The Zenbook UX32LN-R4053H with a dedicated Nvidia 840M graphics card, but otherwise identical equipment is not much faster and ends up with 2833 points in PCMark 8 and 4811 points in the PCMark 7 benchmark. Sony's contender is also within this range, but Lenovo is clearly defeated due to the lack of a full-fledged SSD. Asus installs an SSD in the common 2.5-inch size. The user has the advantage of a lower acquisition price, and theoretically opens the option of exchanging it with a (hybrid) hard drive with a considerably higher storage capacity. Other manufacturers rely on storage devices in a much smaller mSATA or M.2 format, which usually translates into an even smaller design. 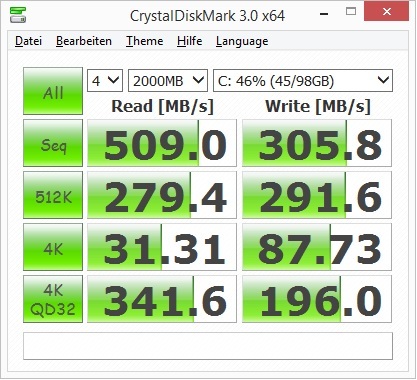 The SSD from SanDisk is nevertheless quite impressive. With read speeds of just below or above 500 MB/s and write rates of approximately 300 MB/s depending on the benchmark, it is not one of the fastest models on the market like in Sony's Vaio Pro 13 SVP-1321C5ER , but the user will unlikely notice gigantic performance differences. 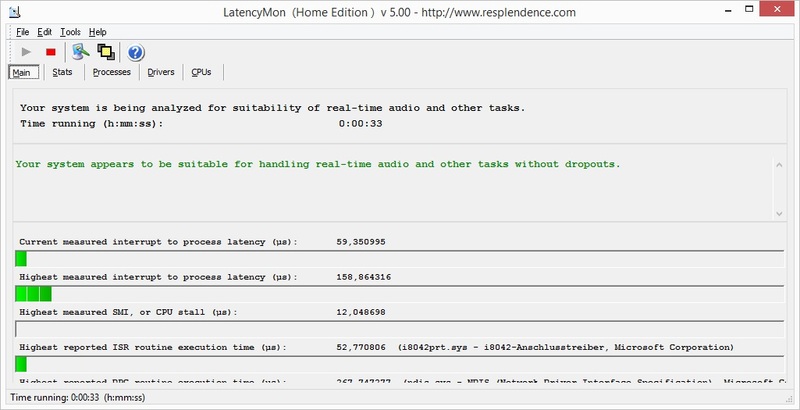 The extremely low access times of approximately 0.01 ms and 0.05 ms in write speak for the installed model. Since different storage devices are built into the various Zenbook UX32LN configurations, the buyer should inform himself particularly on this point. For example, the Zenbook UX32LN-R4053H with a dedicated graphics card and Kingston SSD did not achieve read speeds of over 215 MB/s, which is a considerably poorer rate. Asus seems to have made improvements here. Unlike the UX32LN-R4053H, Asus does not install a dedicated graphics card in our configuration of the Zenbook UX32LA_R3025H. Instead, it completely relies on Intel's integrated HD Graphics 4400. It is explicitly used in Intel's ULV models, is considerably more energy-efficient than dedicated models, and ensures a lower loss of heat. This already shows clearly that Asus does not address gamers with its 200 Euro (~$272) less expensive device, but rather completely focuses on mobility and battery runtime. Intel's HD 4400 is considerably faster than the old GMA offshoot and is enough for office applications, Internet or Full HD videos, but it quickly finds its limits in gaming operation due to its 20 EUs (execution units). The dedicated Nvidia 840M reaches almost 2500 points in the 3DMark 11 benchmark, whereas Intel clearly lags behind with 952 points. Our gaming tests make this lag even more evident. Of course, this ultrabook's field of use is not gaming, but it should nevertheless be possible to play a few games in low details smoothly on Intel's HD Graphics 4400. For example, Grid 2 and the latest Tomb Raider were rendered lag-free with over 53 fps in low settings. However, playing new and demanding games that have a high requirement on the processor, such as Metro: Last Light, is not feasible. A frame rate beyond 20 fps was never achieved even when using minimum settings. 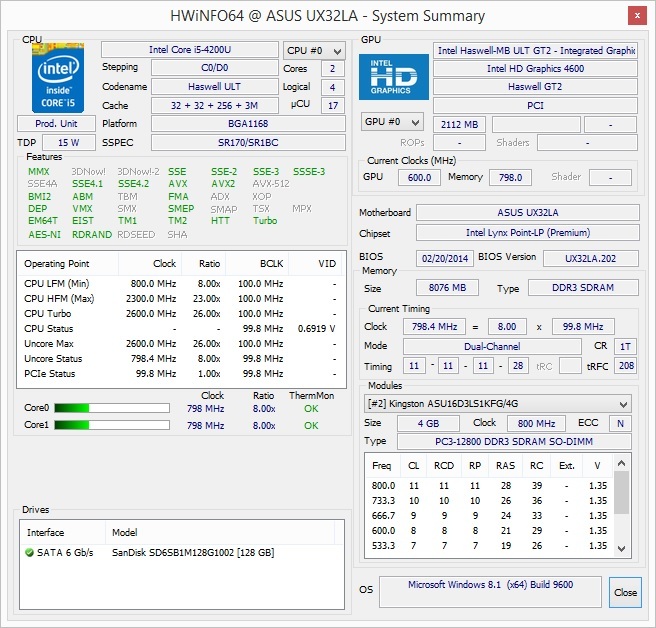 The UX32LN-R4053H model proves that the processor is strong enough. 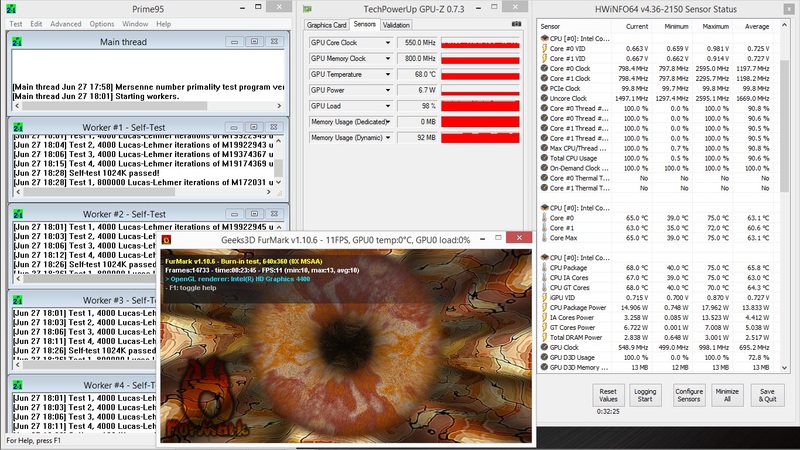 An average of 41.6 fps was possible in the same settings using Nvidia's dedicated 840M. Asus also lives up to the ultrabook claim in this point. The fan is completely inactive in idle mode. The user can work with virtually no noise alongside the SSD. The fan occasionally starts up for a moment only to stop after a short cooling interval. The fan only becomes clearly and permanently audible after a while of heavy CPU load, but is still very quiet compared with other laptops. An average of 33.4 dB(A) during load is still considerably lower than the 47 dB(A) that Sony's Vaio Pro 13 SVP-1321C5ER produces, especially since the decibel scale is logarithmic. No matter whether during full load or idle mode, quiet working is always possible with Asus' UX32LA-R3025H. The installed fan-cooling combination always works quietly and efficiently at the same time. The casing's average temperature of just below 30 °C (86 °F) in idle mode is not much lower than that of the contenders from Lenovo and Sony or even the sister model with a dedicated graphics card. Lenovo is in the lower field with an average of just below 30 °C, followed by Asus' Zenbook with the Nvidia graphics card. However, Sony's laptop is a bit warmer with 36 °C (96.8 °F). This looks similar during load. The review sample gets warm with up to 38.5 °C (101.3 °F) in the casing's center, but it does not come close to the 66 °C (150.8 °F) of Sony's device or the 50.3 °C (122.54 °F) of Asus' configuration with the graphics card. These temperatures can only be produced using tools that simulate full load, and should not occur in routine use. The installed cooling system copes quite well with the ultrabook's heat development. The CPU and graphics unit first throttled after longer stress testing periods. This was also an issue in the sister model with a dedicated graphics card. However, throttling did not occur during normal use in office, browsing, or HD video playback. (±) The average temperature of the palmrest area of similar devices was 28.6 °C / 83.5 F (-1.1 °C / -2 F). Bang & Olufsen – is a name in the professional Hi-Fi sector. Asus now also relies on the experience of this audio expert for its Zenbook line. Of course, the installed speaker combination cannot compete with external 2.1 speakers. Nevertheless, the overall impression is consistently positive for a subnotebook. 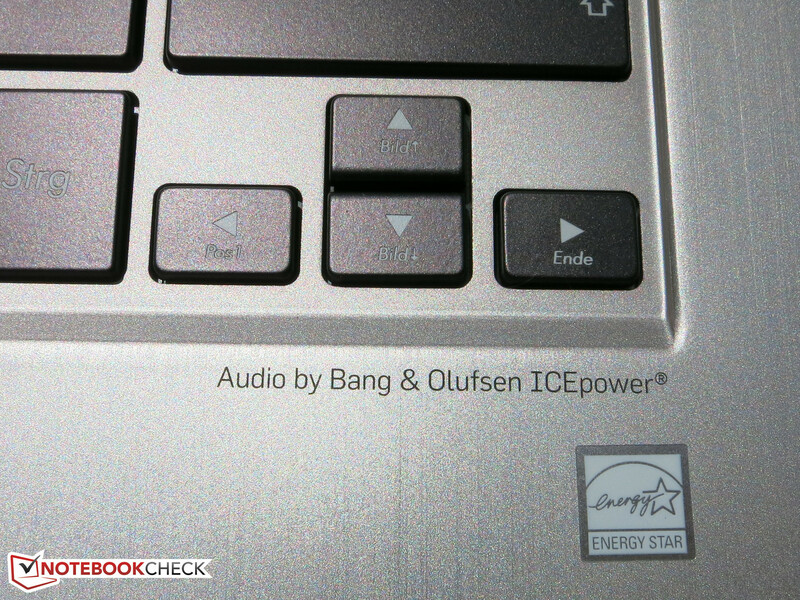 Unfortunately, music playback lacks a clearer bass, but Bang & Olufsen cannot perform miracles due to the ultrabook's rather small size. The trebles and mid-range are very compelling though. Sound sections rarely distort even in maximum volume settings so that not only voices in VoIP calls, but also movies and quieter music pieces are rendered decently. The power consumption of the overall system is very low owing to the energy-efficient ULV processor and lack of a dedicated graphics card. The idle consumption of just 3.3 Watts lets us hope for long battery runtimes. In return, the Zenbook consumes a maximum of over 39 Watts; however, this is when the processor and the graphics unit are under full load, the screen is set to maximum, and all wireless modules are on. Though this rate is very high for an ultrabook, it drops rapidly after a short runtime. The 65-Watt power adapter copes well with the measured power consumption, and heats up to 33 °C to 44 °C (91.4 °F to 111.2 °F) depending on the laptop's load state. Only 0.1 Watt is consumed in standby, and no power is consumed in a turned off state. Due to the quite low idle power consumption and relatively strong 50 Wh battery, we presumed long battery runtimes. And in fact, almost 14:30 h in Battery Eater Reader's test using the energy-saving mode, minimum brightness, and wireless off are convincing when compared with contending ultrabooks (Lenovo IdeaPad U330p: almost 12 hours). The screen is quite dark, but still sufficiently bright for indoor use. The more relevant Wi-Fi test finished after a still very good 10:40 hours. The wireless modules are on, the screen's brightness is set to a consistent 152 cd/m² (dimmed four levels), and the energy-saving profile is enabled. HD videos run for approximately the same time with 10:15 using the same settings because they virtually do not load the processor. The battery of Asus' Zenbook is only overloaded during load. It was drained after just over 2 hours. However, this state does not occur often in real-life use. An ultrabook will rarely be constantly run close to full load in routine use. 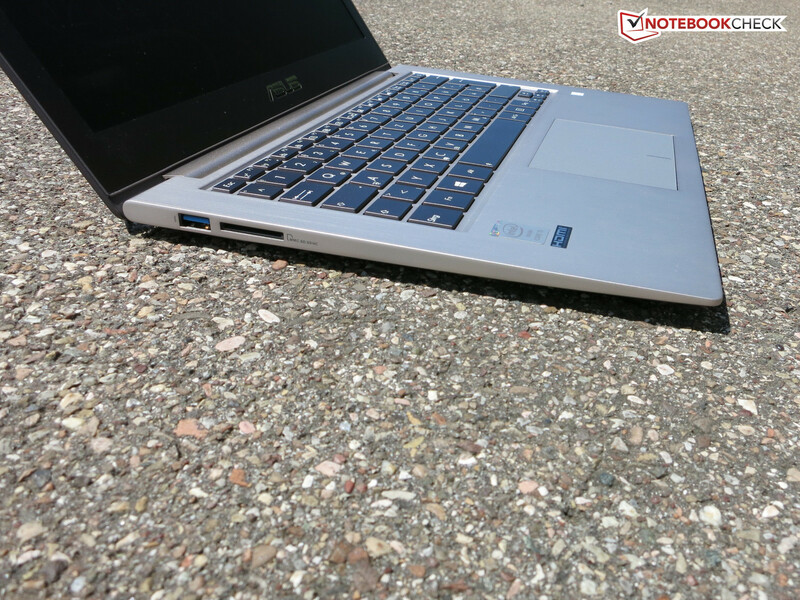 It can generally be said that Asus' laptop achieves very good runtimes in comparison, which are even a bit longer than those of the sister model with a dedicated graphics card. 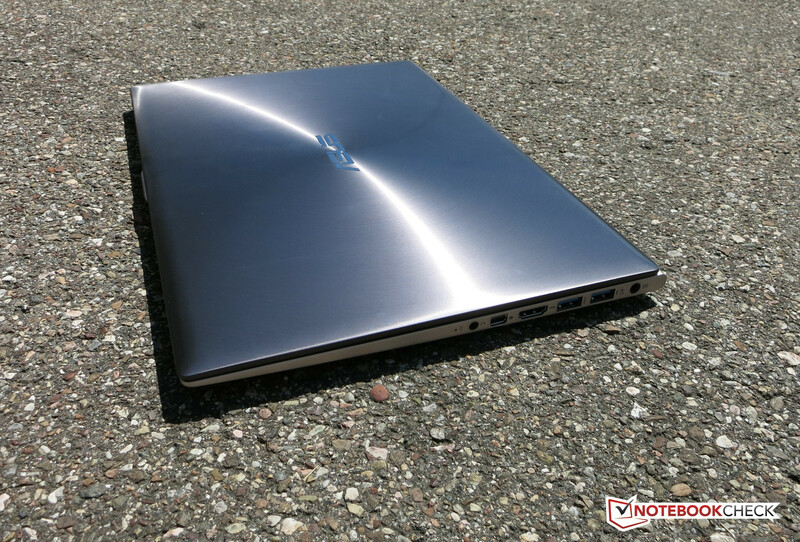 Buyers looking for a long-lasting ultrabook that not only features a good build, but also an above average system performance will be completely satisfied with this device. The one-piece aluminum casing is definitely compelling in both looks and feel. The 50 Wh battery alongside the quite swift yet economical Intel processor and SSD is just right for traveling or use away from an outlet, without compromising system performance. We would recommend the configuration with Nvidia's dedicated graphics chip to users who are attracted to the overall system, but would also like to play the one or other game. Everyone else will be happy with Intel's HD Graphics 4400, and the tested model is a good choice. Only the screen could be a bit brighter and could have a Full HD resolution. Nevertheless, there are currently not many contenders with an equally high quality for 800 Euros (~$1087). All in all, the Asus UX32LA-R3025H is an almost ideal mobile companion. 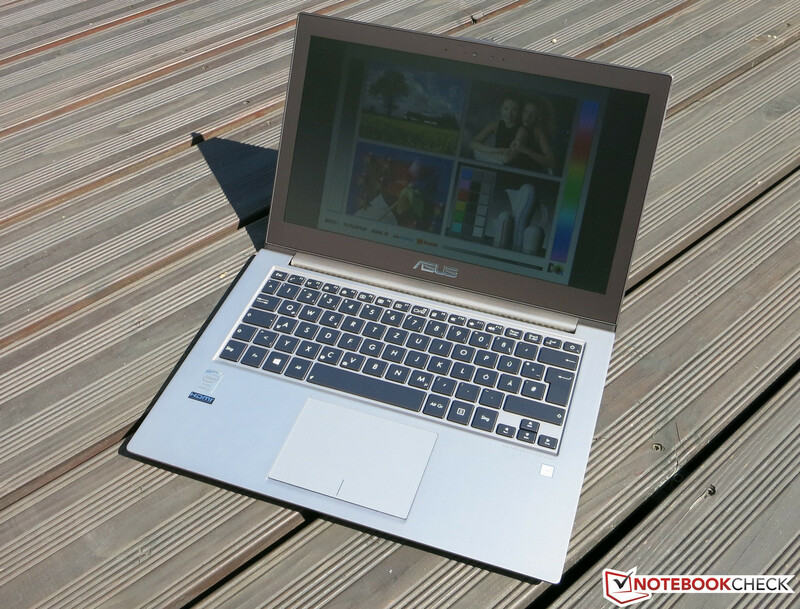 Buyers willing to invest a bit more for a high-quality metal casing and a very good build can certainly take this device, or consider the 100 Euro (~$136) cheaper Lenovo IdeaPad U330p. However, the latter does not sport a swift SSD ex-factory. - Power button located directly beside "Delete"
Very high-quality build fused with premium materials and the latest hardware. The device is delivered in a high-quality box alongside adapters. Very good battery runtimes are achieved with the high-capacity but built-in battery. A stronger, dedicated graphics chip would make a broader field of applications possible (but another configuration of the Zenbook is available for that). The build and choice of materials are simply first rate. It looks and feels very high quality, and is robust at the same time owing to the milled casing.